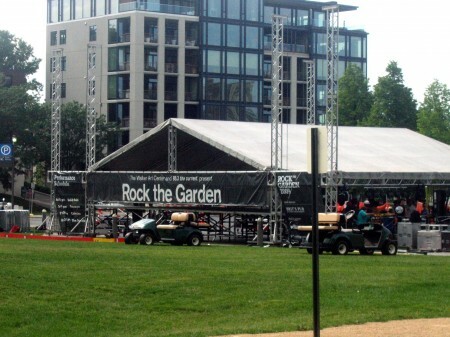 Any discussion of setting up the staging elements for Rock the Garden has to start with a shout out to Tony D. Although the EMP staff worked hard into the night to get the stage up and down in 36 hours, Tony gets my personal “Rock Star of the Day” award. 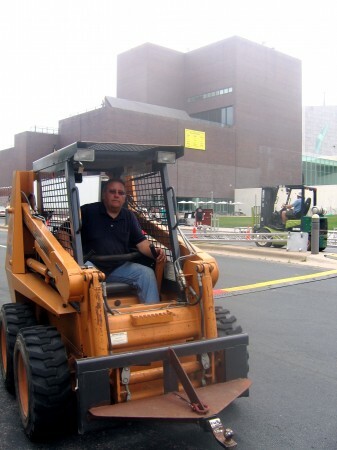 Tony, on a “normal” day at the Walker, is a building engineer in the Building Operations department. Over this last weekend at Rock the Garden, he went above and beyond the call of duty working with us to set up the gigantic power puzzle for the vendors, staging, sound, lighting, MPR, VIP areas and spent a lot of Friday moving big boxes of cable and cable ramps in the Bobcat he brought up to the Walker (from his house!). It’s a good thing we had Tony’s Bobcat on site on Saturday. We discovered right at the end of the show (when our department was starting to strike the stage) that the forklift we had rented had a leak in the propane line! So when our forklift operator started it up to start moving cable ramps and crates, the forklift did a drastic sputter and DIED! Tony D. to the rescue! Less than an hour later, our forklift had a new propane tank procured from Golden Valley and was up and running, but because Tony was there with his Bobcat we were able to keep striking with barely a hiccup. We had a lot to accomplish before doors opened on Saturday at 3pm. The side of the street closest to the Walker closed at 1pm on Friday for us to put together truss, build the roof and construct the staging. Approximately 30 Walker technicians along with the staging vendor’s 25 or so technicians worked together on creating the performance area. By 5pm, we had the roof together and ready to go up! Our main goal was to get this up before it started to rain.